This sends a Workflow member a GatorMail campaign. The screen below will appear once the stage is dragged to the canvas. You may select an existing campaign to send from the dropdown list and click ok.
You may create a new campaign and select ok. If you would like to set campaign merge fields (merge fields 1 - 10, held on the campaign) you may set these here. You may also initiate a campaign at this point. 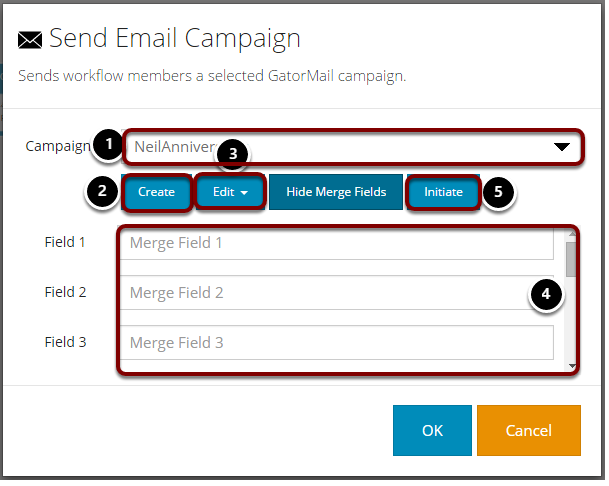 For more information on campaign merge fields see Campaign - Merge Fields.